The Windsor-Detroit Bridge Authority announced Friday that the final deal is worth 4.4 billion U.S. dollars. 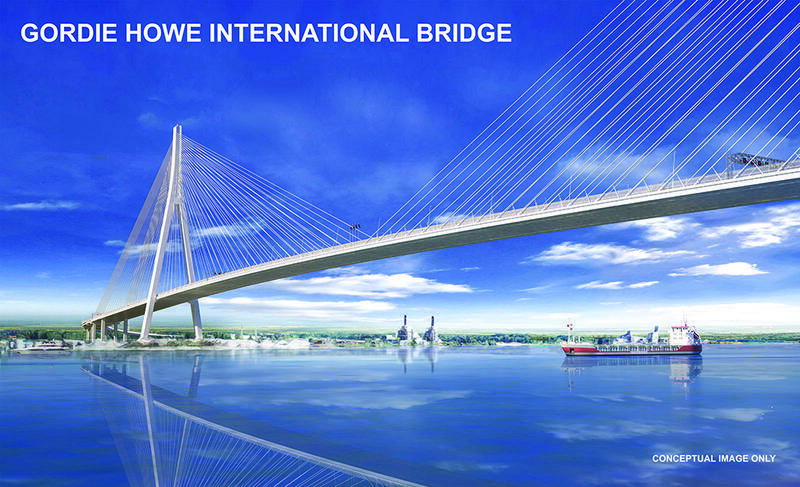 The timeline calls for a six-year construction phase, with the bridge slated to open in late 2024. The contract also covers the following 30 years, with BNA responsible for operating and maintaining the bridge. The Canadian government is footing the bill for the project, which it sees as a key national infrastructure priority. The plan also includes new customs plazas on both sides of the border, and a new interchange connecting the Detroit port of entry to I-75. The bridge will be jointly owned by Canada and Michigan. The package also includes a commitment to a community benefits plan for affected neighborhoods in southwest Detroit and Windsor, Ontario. The final community benefits plan won’t be released until early 2019, but it’s expected to focus largely on two main initiatives: workforce development opportunities for neighborhood residents, including job training and apprenticeship programs; and a $20 million investment in neighborhood infrastructure, including pedestrian bridges, greenways, and more trees. Bridging North America has also agreed to local workforce initiatives in partnership with Detroit and Windsor-area based contractors and unions. Advance construction has been underway for some time in both Detroit and Windsor, but the WDBA is hosting a groundbreaking celebration for actual bridge construction next Friday in Windsor. A spokesman says work on the bridge itself will start before the end of this year.